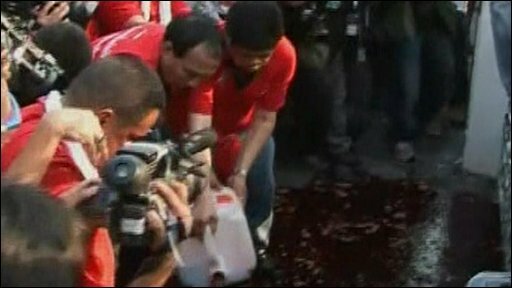 Thailand's red-shirt demonstrators have splashed blood under the gates of Government House in a protest against a leadership they say is illegitimate. Earlier the protesters lined up to donate their blood, as the anti-government rallies entered a third day. So far the protests have remained peaceful and both sides say they want to avoid violence. Thai Prime Minister Abhisit Vejjajiva on Monday rejected a demand from protesters to quit and call elections. The stand-off is the latest in a deep political schism in the country linked to the 2006 military coup which deposed former leader Thaksin Shinawatra. This has been another show of strength. The protesters have not gone away, although there aren't as many of them on the streets as there were on Sunday. It is now mid-week and some people have had to go back to their jobs - but many people here have come great distances. So one of the big questions now is how long the red-shirt movement can keep this going. But for three days they have managed to get a large crowd at specific spots at an appointed hour and carry out a symbolic protest. No-one is backing down, there has been no shifting in positions at all. The red-shirts say they are still demanding that the government dissolve parliament and call fresh elections; the government is saying it will not bow to that pressure. It really has become a test of wills now. Tens of thousands of security forces remain on standby and army leaders say they plan to be flexible and gentle with the demonstrators as their protests continue. In Bangkok, red-shirt leader Veera Musikapong was the first to donate blood for the protest. "This blood is a sacrificial offering. To show our love for the nation, to show our sincerity," he said. "If Abhisit is still stubborn, even though he does not have blood on his hands, his feet will be bloodied with our curses," another leader, Nattawut Saikur, said. As night fell, protesters converged on Government House. Police allowed a group of them to approach the gates and splash the blood, a gesture shown on national television. Not all of the blood has been used. Red-shirt leaders said more would be poured at other sites if their demands were not met. Health officials, the Red Cross and even the protesters' figurehead, Mr Thaksin, expressed concern about how hygienic the mass blood donation was. I met a group of nurses and doctors volunteering at one of the many first aid stations. They asked not to be identified since their hospitals told them not to help the Red Shirts. Nevertheless, they came anyways "to help the people, and because our hearts are Red." But the protesters, including several monks, brushed off the concerns. "We have three tents for blood donations. All people who conduct the blood drawing will be doctors, nurses or other qualified people who came here voluntarily," said senior red shirt leader, Dr Weng Tojilakarn, who normally runs his own medical practice. Somsak Janprasert, a retired railway official from Bangkok, told AFP news agency that he was donating blood because he wanted a democracy. "This is a very symbolic way to express that our blood, the people's blood, is power," he said. For its part, the government remains quiet on the sidelines. A cabinet meeting scheduled for Tuesday appears to have been cancelled, and calls from members of Mr Abhisit's coalition for a parliamentary hearing have been ignored. Mr Abhisit, meanwhile, said the government was making every effort to avoid confrontation. "I want to insist that there was an attempt to create conflict and the government has proved that it will not use violent means against the protesters," he said. "The symbolic event they are talking about is bloodshed, but that is not correct. It is not as if the government is trying to use violence to create bloodshed, it's not the case at all." The protest, led by red-shirted supporters of Mr Thaksin has been one of the largest in recent years, although the BBC's Rachel Harvey, at the scene, says the numbers appear to be dwindling. The protesters say the present government was installed illegally after Mr Thaksin was ousted in a military coup in 2006, and two subsequent allied governments were deposed by court action. On Sunday they held a mass rally in central Bangkok. Local newspapers have reported that protests were also being held in several northern provinces to coincide with the Bangkok actions. Send your pictures and video to yourpics@bbc.co.uk, text them to +44 7725 100 100 or you have a large file you can upload here.